I bought my hybrid from Jungle Music back in June of 2011. It was smaller, in a tree pot which I think might be a three gallon size. It has been in the ground for three years and two months. The growth of it is very fast. I would put it on par this year with a fortunei or faster. 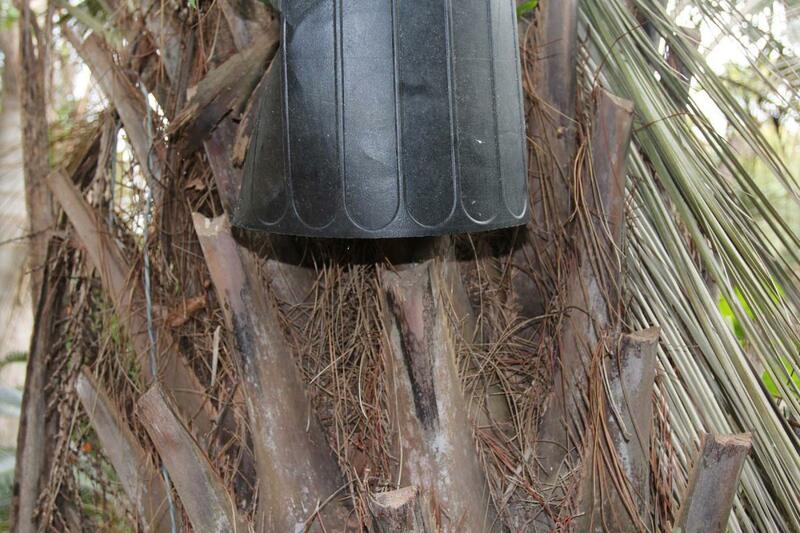 The trunk is really getting thickness to it.It is not only faster than a butia, but it seems to take less damage in the winter. It sailed through the coldest night here back in January; it dropped to 10F that night. I did have a frost cloth thrown over it, but it blew off sometime that night. 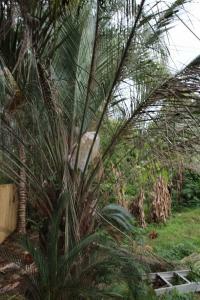 The cloth was over halfway off, and the palm was exposed. 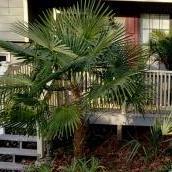 I highly recommend this palm! Here are pictures from this past Saturday. WOW thats some great grow rate. I got mine as a little two year old seedling and is only about half that size and twice as old, LOL! Are you in 8a or 8b? I’m in 8a here in PNW. Your palm looks Great. Thank you for the kind words. I am in an 8a, but typical winters here are milder than that. The vortex gave us that one night of a low of 10 F. We have tons of heat and humidity in the summer. ..I think it loves the heat, even though I believe Jubaeas prefer a bit milder summers. The hybrid seems to be a contradiction to both parents: faster growing and more cold and heat tolerant. 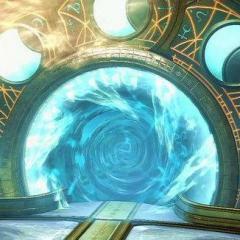 Do you have pictures of yours? Out of curiosity, are there hooks at the end of the fronds? I have a plant that is supposedly a hybrid, but does not have hooks. I am wondering if it is BxJ rather than JxB. Sorry I don’t have a current pic for this year, but I’ll take one this weekend for yea. Also welcome to Palm Talk! Ben I have seen BxJ and JxB with hooks and some without. But don’t really know why that is. Thank you for the welcome! I look forward to the pictures. Ben, mine does not have hooks. I also have heard they don't always have hooks. Interesting, thanks guys. I guess I don't really know what I have but my suspicion is BxJ. I would think mine is a B X J instead of a J X B, but Phil said it was a J X B and its growth, especially the girth of the trunk, points toward the Jubaea as the mother. Is your trunk gaining size rapidly? Scot, your palm looks super healthy and the blue on it is sublime. 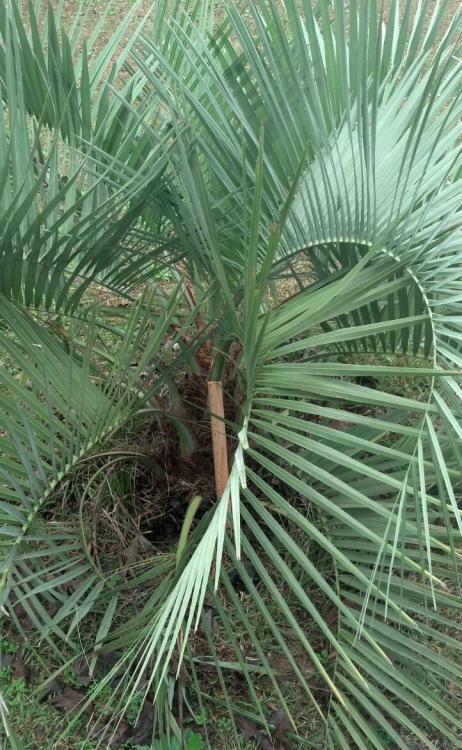 Just a question(I don't know much of anything about Jubaea as we can't grow them and thus have never seen a real one in person) what characteristics on this palm, give it distinction over a regular Butia odorata? Thanks and it was my pleasure to view this thread! Thank you Mandrew! I bought it from Phil at Jungle Music, and he sold it to me as a J X B back in 2011. I have to take his word at it. 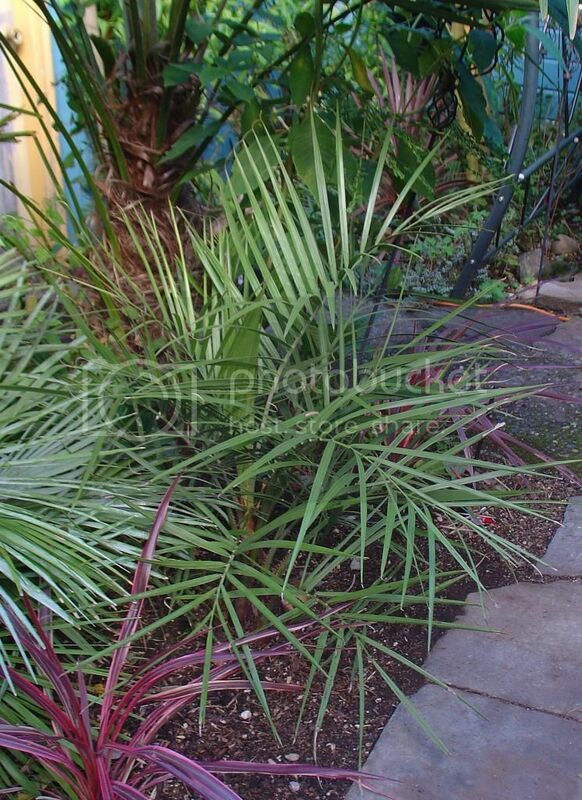 I agree that it looks more like a butia, but I have noticed that it is forming a thick trunk at a young age, its growth is on par with my fastest Trachycarpus, and it tolerates cold better than my older Butias. My two older Butias had a little older frond burn from January. I was worried about not having hooks on its ends, but then some of the guys on the other cold hardy board mentioned theirs did not either. 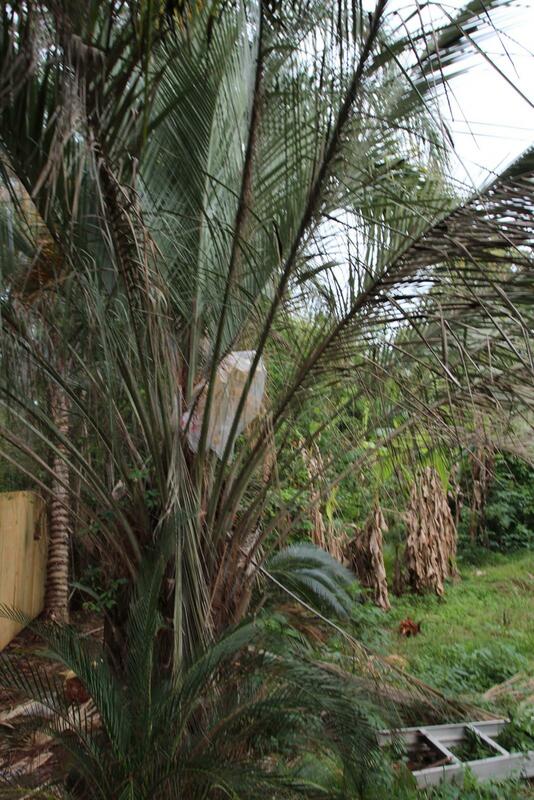 I think it would grow like a champ for you since it is not pure Jubaea. Thanks for sharing- Its very blue- more than I thought it would be. Nice man ! 10F is a good number for me.. so you didn't add heat or anything? I'm hoping my trash can protection will be good enough. 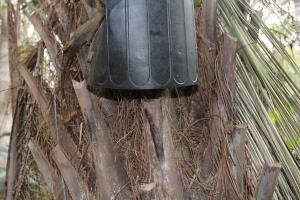 While filifera will grow here the added benefit of this palm not getting palm damage in my climate is a huge benefit. Makes me wonder how much cold they can endure. Thanks Sailor. I appreciate the compliment! Filifera will grow better for you than me because you guys are a lot drier in winter. I think the best for my area is filibusta. If I knew for sure I had a 100% pure filifera I would give it a go though here. I did not add any heat sources. I figured the cloth would be enough, and of course, it came off during the night, so it may have spent hours exposed. The saving grace for South Carolina is that we typically heat up the next day. Just be careful with plastic of any kind. I always heard plastic would harm plants that it came in contact with if it was cold, and that it doesn't breath. If you use a plastic tarp, I would wrap it first with frost cloth or even a quilt. I am not an expert on cold protection since I really don't push my luck with anything too out of zone for me. 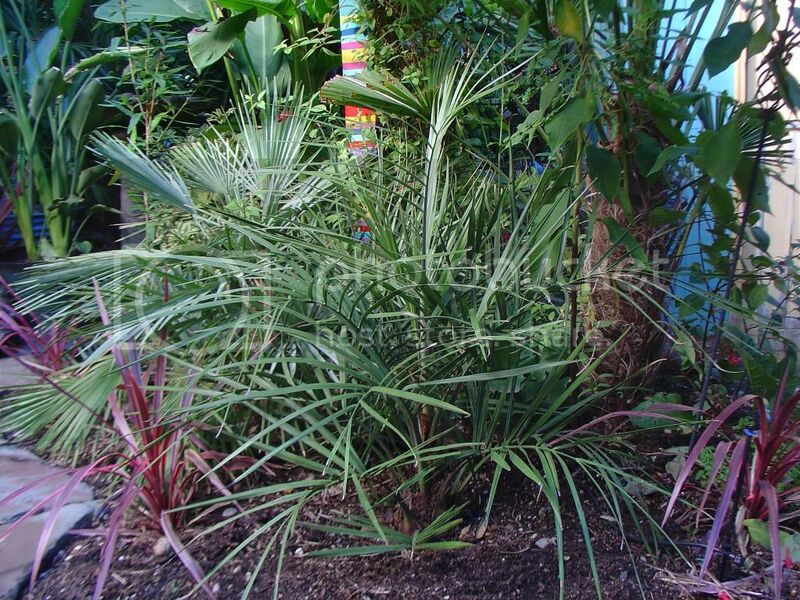 I mainly have bulletproof stuff like different types of Sabals (Minors, Palmetto, Riverside, Princeps, Uresana, Birmingham, Brazoria, Tamaulipas, Louisiana), Butias, hybrids, Rhapidophyllum hystrix, Trachycarpus fortunei, takil, and wagnerianus, and Chamaedorea Radicalis trunking variety. I think I am going to try a CDIP and Mule next year though. Thank you again for the kind words and for looking. Here is my pic of JxB F2. I did have spear pull on this one but it has recovered nicely once the summer heat started in July. The bad thing about this planting area it receives no winter sunshine between October to March. Does seem to be a faster grower. She is a little beauty Palm Crazy. Where did you get her if you don't mind me asking. Thank you for posting pictures! Got it from Patrick in CA. Six years in the ground from a two year old seedling. 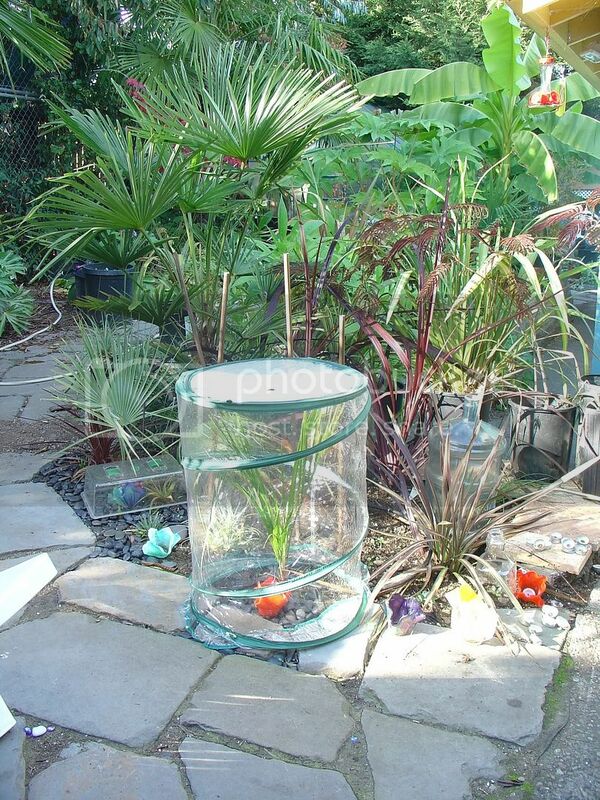 Here’s how I protected it when it was younger…popup greenhouse. During the big cold events I only used one or two candles at night and that did the trick. In fact it actually grew a little during a few very cold events. LOL! Wow, that is too cool. I think it has grown well considering your cooler summers. We usually are in the 90s and some 100s here, so most of my palms love the extreme heat...my trachycarpus don't mind it as long as I keep them watered well. I think you have a very nice palm. I love the look of your yard; from what I see it looks very lush and healthy! Weather here is 10F cooler than you year round. Especially spring only 60’s to low 70’s, summer upper 80’s to low 90’s, in August to mid Sept. We are only in the 60’s now and heat waves only low 70’s. But hey it sunny here. When the rainy season starts its just one rain storm lined up after another…but (weather channel) saying that this fall is going to be dryer and much warmer. I hope so! Thanks for the nice garden comments, it pretty easy to grow stuff up here…. Just not feather palms or heat loving plants. Your palms are looking Fantastic. Thank you for the compliments Palm Crazy. You guys in the PNW can grow some really nice plants that can't stand our heat and humidity. The rain forests up that way are incredible. Candles? Really?? That's interesting lol. Did you use a tea lite or something? Wow, such a pretty palm. I had a chance to buy a couple (I believe it was the same hybrid as yours), but I decided against it. Then again, the pair of J x B's I was looking at weren't as well kept up as yours were, and probably a little smaller. 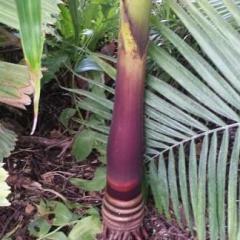 And this certainly must be a contradicting palm if it's able to grow in the pacific northwest! Butias deal with the wetness down here okay from what I've seen, but everything I've read about Jubaeas is that they outright do not like the wet! 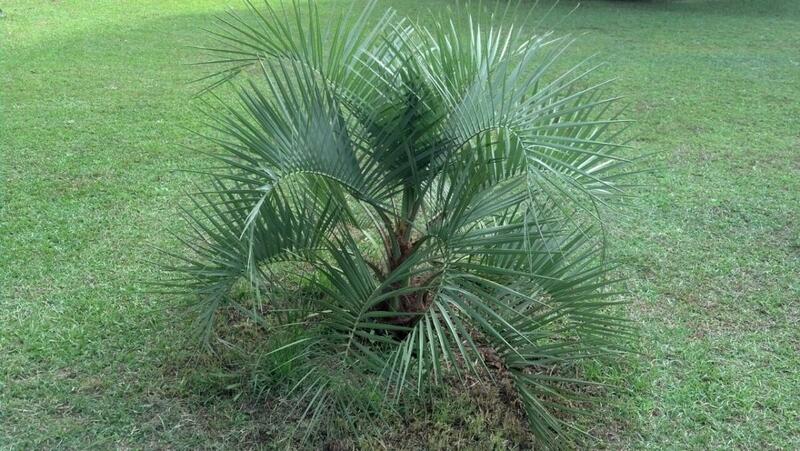 Impressive what you've got going on there, Palm crazy. Keep us updated as well. Hey Smithgn, did you find some hybrids locally? Thanks for the kind words by the way! Scot- I actually got them from a guy in the Orangeburg area. Long story short, he's relocating overseas and he had dozens upon dozens of palms he was trying to find a home for. I actually wound up going with Gayland since he was the one who told me about the guy. Gayland actually wound up buying the J X B hybrid, and it was just one now that I think back on it. What a small world! Gayland has some very good stock and prices, and I want to visit his place sometime soon. It is funny how palm folks often "travel" in the same circles. Very true. We're all a bit of an odd bunch and somehow or another we wind up finding each other (ha!). Yes candles, LOL! The ones I used came from a dollar store and they were short fat candles in glass container. As the wax evaporated it would heat up the glass so hot you couldn’t handle it with your bare hands . Each candle was cheap and lasted 12 hours. They would put out a lot of heat. The store closed a few years ago and I haven’t seen anything like them here at any other dollar stores. They worked great for me when the palms were smaller. Jubaea do better here in the PNW than Butia. 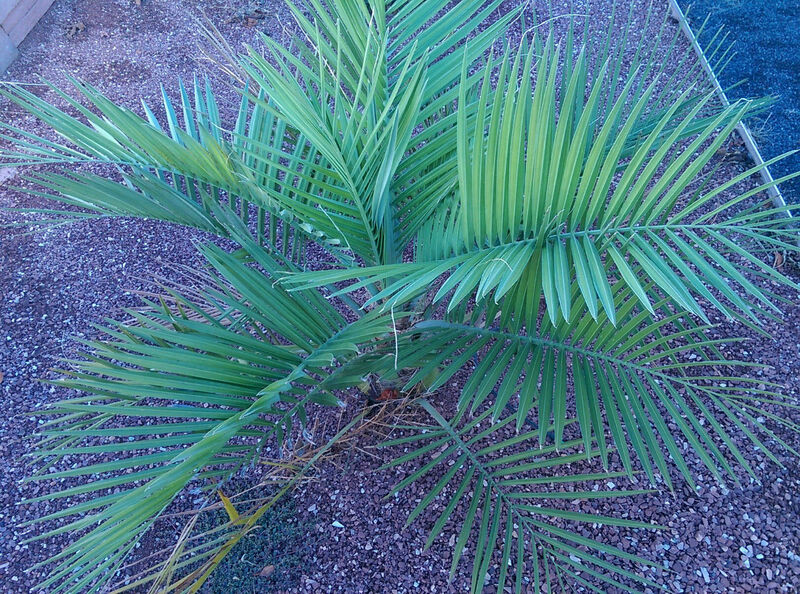 Jubaea tolerate all the cold winter rain better up here, I think the crowns are more tighter or something than Butia. But you’ll never see any real big ones here unless your in a good micro climate, which I do not have. If I was in a solid 8b exotic palms would survive here a lot better. 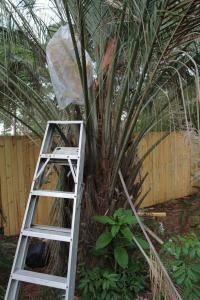 So every 10 years I have to start all over with feather palms, LOL! And what happens up here, is after a really bad winter that kills butia the box stores bring more up from Cali and put them at ridiculous low prices so people like me are sucker into buying them again. $15 for a nice size 5 gallon butia is cheep here. So I got a JxB from Patric Schafer this weekend, and it looks markedly different from my other plant. 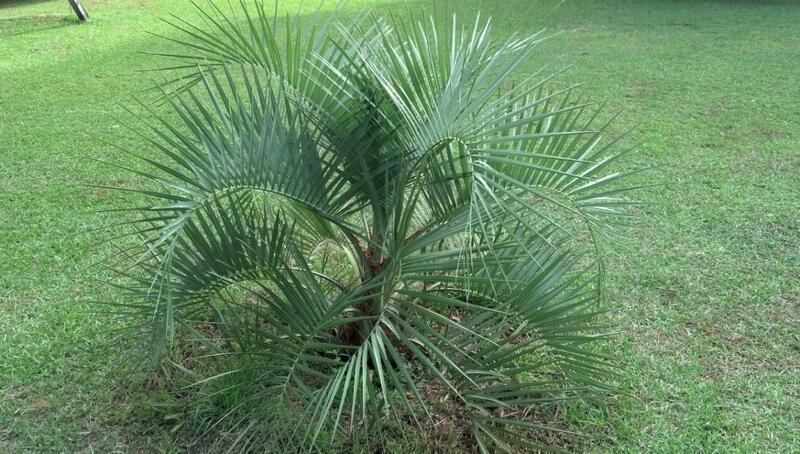 I think I am settling on my original as a BxJ, it has much more of the Butia look to it. I'm going to try and post pictures of both. 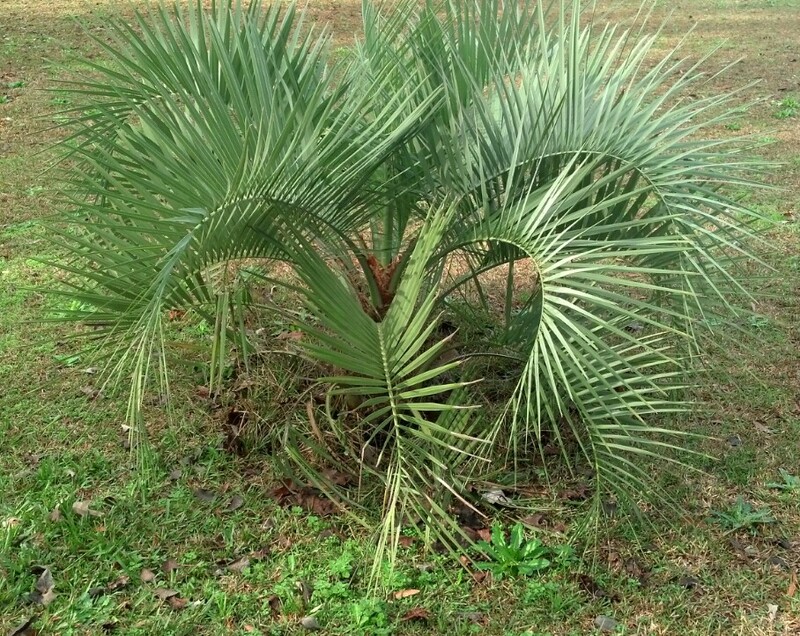 The opening leaf of your BxJ looks exactly like mine does.. the center spear is way way way thicker than my regular butia though.. opens a little differently too. 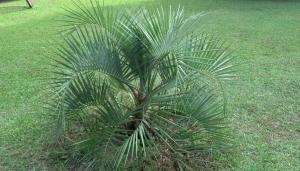 Yours already looks more graceful than a butia. Beautiful specimen. These confusing palms are my favorites. 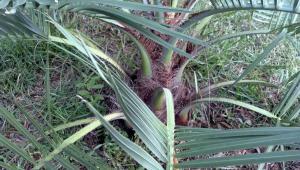 I think my J X B has more butia coloring, but its speed tells me it has to be mixed. The trunks on these things get massive. I got one from the very recently late Merrill Wilcox about 20 years back very little Jubea blood maybe 1/16 or so. Looked so Butia like until it got the trunk still Butia like but very stout trunk -- I reckon the only definitive way to tell is to look at a think section of leaf and compare to microgrphs of Jubea and Butia very distinct differences in the vascular bundle between these two . But a real robust plant with a massive trunk is what we want. Hello Ed! Thank you for your reply and information. Would it be possible to post a picture of your palm? I agree that this hybrid seems to be a great boon to all of us in zones 8 and even 7. Does yours have more of the typical Butia color and frond arch? Thanks! I know what you mean! It's hard to turn down palms at such a good price. I already have two windmills but every year it's so tempting to buy more since they're so darn cheap! So, what exactly happens with your Butias? You'll have them for 10 years or so and eventually a cold spell will knock them out? Do they get too large to protect? I know, LOL! This spring I got sucker punch by a nice double trunk trachy, I don’t really need another one, LOL! Never seen that before. 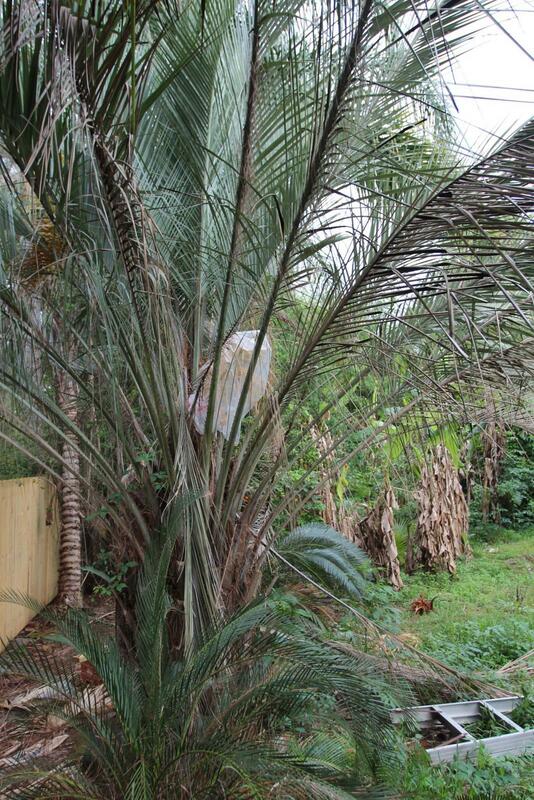 The old butia’s where pretty good size for 8a, the biggest one was 14’ wide and 9’ tall. All were to big to protect and three nights at 12F and 5 days below freezing was to much for them. All most all of them started to recover but the next two winters were bad, so down they went. Took four years for the trunks to rot off. Awesome! Thank you for the pictures. It seems to have a looser form than a regular butia, even ones in the shade. Thanks for the kind words. I just took a few pictures with a fifteen inch ruler for comparison. This palm keeps humming along! 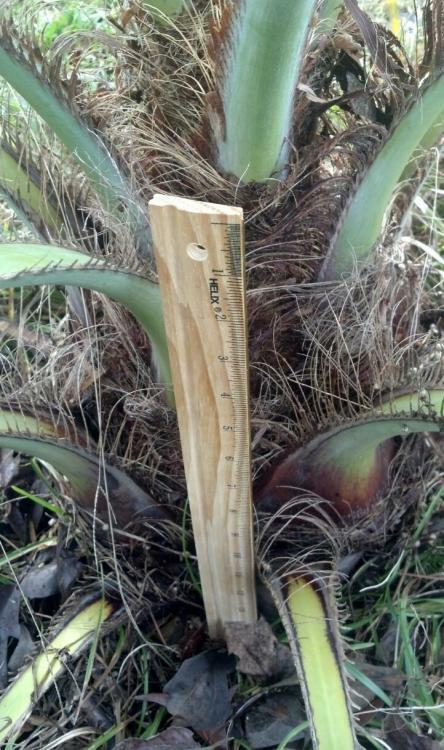 Here is a picture overall of the palm with the fifteen inch ruler for scale. Geez Scot, this thing is a beauty. Can't wait to see it in 5 years or so. And with the mild weather we've been having lately, I'm sure it's been growing a good bit! Jubea's love cool weather (so I've heard) and this is right down their alley. Thanks Nick! I can't wait to get Patric's hybrids in the ground next year and compare them to this one. Patric's hybrids have grown a lot in their pots since I got them earlier this year. Didn't you buy a few of his hybrids? Very nice... I have one although it looks a bit different. The leaves are tough as is the spear..feels like tough plastic. I didn't protect it during our recent storm.. but I will just to be on the safe side after we warm a bit. 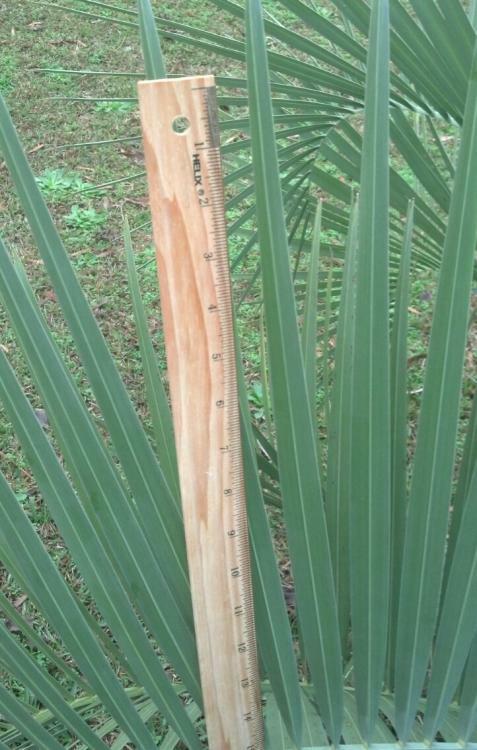 This palm may be built for my climate. How tough are the leaves on yours? Your palm is fantastic !